I want to buy a photo printer when to change ink catridges? When should colour ink be changed? Ink cartridges should be changed when the printer indicates that the cartridges installed are empty or if the print quality deteriorates drastically. I have a Canon Selphy CP730 printer. Do you do ink alone as I have stacks of paper? Thanks , Graeme. Canon don't manufacture separate ink cassettes for the Selphy range of photo printers. Therefore, to get the ink for your Canon Selphy CP730 printer, you need to purchase one of the photo packs listed on this page of our website which will include ink and paper. Unfortunately, individual ink cassettes aren't available from any retailer. I'm trying to buy Canon CP730 ink cartridges with postcard paper not postcard size paper? I have both CP730 and CP720 printers. Will your ink sets fit both of my printers? Do Selphy CP730 and CP720 use the same inks? Yes, both the Canon Selphy CP730 and Canon Selphy CP720 take the same cartridges. The cartridges are sold in a pack that contains the cartridge and a particular size of paper. The paper size needs to match the paper tray size that you are using with each printer otherwise the cartridge and paper pack will not work. If you have any problems finding the paper size that you need, please don't hesitate to contact us. Canon CP730 give excellent prints with real clarity. Some day in the future your Canon CP730 will run low on printer ink, and when it happens you'll quickly notice that buying Canon CP730 ink can be quite pricey. But you do not need to be concerned about coughing up the high costs you'll uncover on the main street because here at Cartridge Save you can buy all the Canon CP 730 cartridges you want at seriously low prices. Spend less money on your ink by shopping with Cartridge Save! Why spend more to buy the CP-730 original cartridge or CP730 compatible ink on the high street when it is far more straight forward to save a bunch of money shopping online with Cartridge Save. Have total confidence by purchasing Selphy CP730 ink cartridges from us seeing as every one is guaranteed by a quibble-free money back guarantee. Be mindful of the fact that every purchase also comes with free delivery, mostly delivered to your doorstep the next business day! Printing pictures during vacations can be done easily with the compact and lightweight Canon Selphy CP730. It can be used with an optional battery pack. It also has direct printing features for both cameras and memory cards. It features a 2" LCD colour screen and offers wireless printing with IrDA and optional Bluetooth adapter. The Canon Selphy CP730 is specifically made for photo printing, so it can only print a maximum of 4 x 8 inches media. Print speed is a bit slow. The Canon Selphy CP730 comes in a clean white colour and a block shape. It has an easy-to-use control panel on top along with an LCD screen. There is also a pull-put paper cassette that slides neatly below the printer. The Canon Selphy CP730 uses dye-sublimation thermal print method and has a maximum of 300 x 300 dpi resolution. When photographs are stored appropriately, colours can last for up to 100 years. The best part of the Canon Selphy CP730 is its light weight and compact size. It offers high-quality prints on media like business cards, postcards, photo paper, and stickers. Users can print without a computer by using their digital cameras and the PictBridge port. There are also memory card slots and an LCD screen on the Selphy CP730 to ensure that photo printing is convenient. Postcard sized photos can take around a minute or more at best mode. 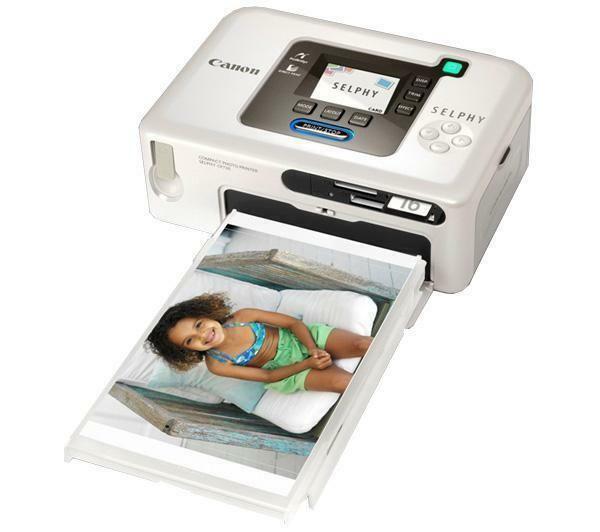 The Canon Selphy CP730 is slow compared to inkjet printers.